Tag Archives for " Noah St. John "
Thursday is guest post day here at Duct Tape Marketing and today’s guest is Noah St. John – Enjoy! Naturally, every business owner wants their business to grow. When you’re trying to change anything about your business, or your life for that matter—whether you want to gain more customers, increase profits, improve your health, or whatever result you’re looking for—what you’re really trying to do is create a new reality for yourself. Let’s illustrate that by saying that you want to go from your current reality to a new reality. 1. Right now, you are living in what I call your Current Perceived Reality (CPR). In your CPR, you have what you have, you know what you know, you do what you do, and you are what you are. This is your Current Perceived Reality—and to you, it is reality. It is your own little universe. 2. What you want is to be someplace else. That “someplace else” is what I call your New Desired Reality (NDR). In this case, you want to grow your business. But it could just as easily mean you want to change your health, your weight, your finances, your relationships, your sphere of influence, or any number of other things. 3. Between your CPR and your NDR lies what I call your Belief Gap: the space between where you perceive you are right now (your CPR) and what it will be like when you arrive “someplace else” (your NDR). 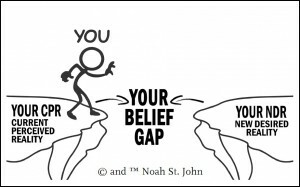 How big is your Belief Gap? That depends on how long you’ve been in your CPR, how hard you think it will be to get to your NDR, how many of your friends and employees tell you, “It’s impossible,” when you tell them your dreams; and so on. Bottom line? Your business may be failing because you haven’t bridged your Belief Gap for the results you want and are working so hard for. No, that’s not a typo. Afformations are a new technology of the mind that immediately changes your subconscious thought patterns from negative to positive. Afformations use your brain’s “embedded presupposition factor” to change your unconscious assumptions about what you can and can’t do (see #3 below). Using Afformations has helped thousands of business owners bridge their Belief Gap and add millions in new revenues while working less and having more time off. 2. Ask yourself what you really want. It’s true: You can’t get where you’re going if you don’t know where that is. Ask yourself, “If time or money were no object, what would I love to be, do, or have?” If the answer doesn’t frighten you a little, you may not be asking big enough! You are continually forming assumptions about life and your relationship to it. The problem is, many business owners assume negative things like It’s too hard or If I haven’t done it by now, I’ll probably never do it. If these are your unconscious assumptions, your actions will be tentative, fearful, and anticipating failure—and your results will be less than desirable. Just because you’ve failed in the past does not make you a “failure”. The simple fact that you’re reading this right now means that you are far stronger than you think. 4. Take out your head trash. Most business owners are constantly focused on what they don’t have and who they are not. I call this your head trash. Imagine if every negative thought you had ever had was a piece of trash in your home. Now imagine that you never took out the trash. Your home would be pretty disgusting, wouldn’t it? Take out your head trash and you’ll find that it’s a lot easier to breathe—literally! Bottom line: Use Afformations, take out your head trash, and watch your business—and your life—change in amazing ways. 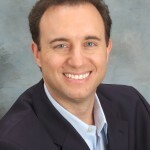 Noah St. John is famous for inventing Afformations® and creating customized strategies for fast-growing companies and leading organizations around the world. His sought-after advice is known as the “secret sauce” for creating superstar performance. Get $500 worth of “The World’s Greatest Abundance Training” FREE when you get The Book of Afformations at www.AfformationsBook.com/more.